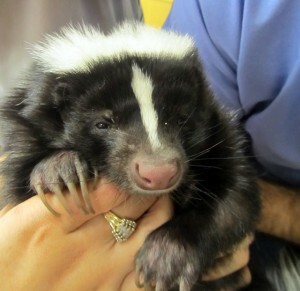 Skunks are becoming increasingly popular as companion pets in the Unites States. There are many factors to consider before committing to a pet skunk, and one of the most important is the serious problem of biting and the potential for aggression if left intact (not spayed or neutered). Skunks have very long, sharp canine teeth which can inflict a painful, sometimes serious wound. While socializing baby skunks with frequent handling and cuddling will help, it is vital to have them spayed or neutered between 4-6 months in order to prevent the serious aggression that often leads to pet skunks being handled less and often results in owners not being able to keep it as a pet. Skunks are from the family mustelidae which also includes ferrets and weasels. They are very intelligent, curious animals and are naturally nocturnal (sleep during the day and are active at night) but can adjust to a diurnal lifestyle. Pet skunks are not wild skunks, but domestically bred. Breeders will have their foul smelling mercaptan-emitting glands removed at approximately 4 weeks of age in order to make them tolerable in a domestic setting. Skunks living indoors can be destructive due to their curious nature; they will dig into carpets, turn over garbage cans, and open/empty drawers if given the opportunity. They are easily litter-trainable and can be trained to walk on a leash. There are many plausible reasons to spay female skunks. Females will reach sexual maturity from 9 months to one-year-old. In captivity, an intact female will often begin estrus (go into heat) and will remain in this state for a prolonged period if not mated. This prolonged estrus causes severe bone marrow suppression in skunks due to the persistent hyperestrogenism. This suppression will then cause severe anemia (low red blood cell count) which, if not addressed, can result in death. Also, if intact female skunks survive the complications of the hyperestrogenism, they frequently develop other reproductive diseases. This includes various forms of cancers of the uterus, ovaries, and mammary tissue. Some of these cancers are benign, but grow so large that they cause significant secondary physical impairment. Many of these cancers are malignant, and will spread to lymph nodes and other organs. And finally, aggression is one of the most noticeable negative aspects of housing intact female skunks. A seemingly docile baby can become extremely agitated, even vicious when sexual maturity begins. This sometimes savage behavior can persist and often does not resolve when spayed at an older age (past one year). For this reason, we strongly recommend spaying all female skunks by six months of age. Male skunks reach sexual maturity younger than females, generally from 4-6 months old. While the health risks of leaving a male skunk intact are significantly less than that of the females, they can develop testicular cancer. However, most people choose to neuter their male pet skunks because of the behavioral issues that often arise when they are left intact. While skunks do tend to be good at using litter boxes, males will often urinate inappropriately when intact in an effort to mark territory. This habit can be extremely disturbing to human family members. And similar to females, when they develop into sexual maturity, they too can become very aggressive towards people. The procedure to spay or neuter a pet skunk is similar to that of a dog or cat, however it is important to use a veterinarian who is experienced in working with pet skunks. There are anatomical differences from dogs and cats plus anesthetic requirements that will also differ. They generally will stay one night in the hospital to recover and go home with an oral analgesic for pain relief for up to 5-7 days post surgery. Once this surgery has been performed, pet skunks tend to remain docile and loving if they continue to be socialized and handled frequently. They can make charming companions with tremendous personality. They do require annual veterinary care which will include specific vaccines and de-worming depending on your geographical location. We strongly recommend discussing diet with your skunk-savvy vet when they are babies to get them set on an appropriate diet early in life. And be sure to research the laws in your area regarding keeping pet skunks. Many states require special permits or do not allow them. But remember that either way, veterinarians do not confiscate “illegal” pets unless there is cruelty or negligence involved; our job is to help animals medically, not perform police work! Hopefully this article will help illuminate the importance of spaying or neutering pet skunks. Please contact us if you have any questions, concerns, or if you would like to schedule an appointment.